Ballet is an excellent form of exercise. Adult ballet classes develop balance and promote emotional & physical well being. Each muscle group is engaged in movement and the brain is used to aid fluid movement, interpret music and memorise steps. Classical music used in class is both invigorating and relaxing. Ballet is an all win form of exercise and a chance to make new friends. Men and Women can start adult ballet classes at any age. It can be worrying for some people who think they will be unable to keep up with the class. However, they soon realise how much fun it is and such a great way to exercise. I hope to see you in class soon. We welcome new pupils at any time during the year. Our classes are for adults of all abilities. This class is for those who have some ballet experience and beginners. Your experience may have been many years ago or after a short gap with the need to regain strength. The group is very friendly so why not give it a try. 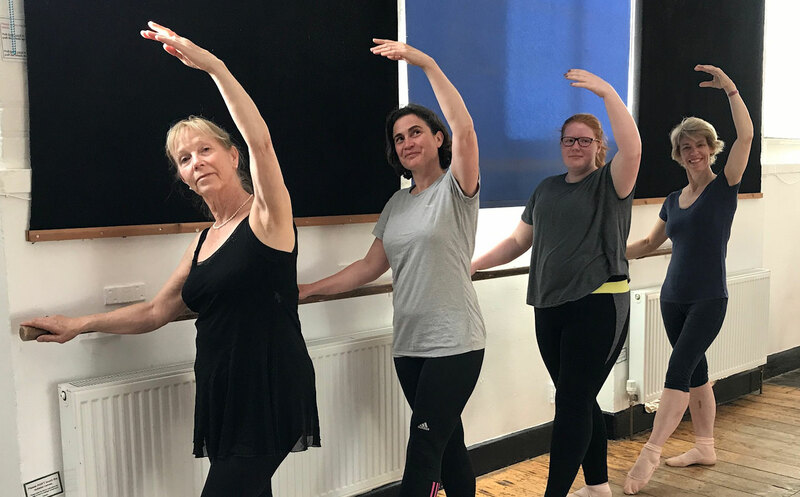 Adult ballet class for complete beginners. I am often asked to teach the basics so for all of you who would like to start slowly with a very patient teacher please book this one. It’s never too late to learn to dance! For those interested in the exam syllabus and improving technique. This class is for those who have had ballet training and wish to progress with technique and gain strength. Beginners are welcome. Ability level moderate. The class is friendly and welcomes new members. Intermediate foundation Syllabus. This session is for adults and mature teenagers who are strong technically and able to execute the fairly demanding syllabus. Some pointe work included. Adult ballet improves flexibility, core strength, coordination and posture in a relaxed atmosphere. Phone, text or email to book adult ballet classes.